Our Parvaneha program started in September 2016 with the aim of providing social, psychological and educational support to the young women in our program, who had missed out on early nurturing experiences in life. Parvaneha is the OMID program that was specially devised for young women with extreme traumatic pasts, who need individualized therapeutic support and help with adapting and integrating with others. These are young women who have been so damaged by abuse and neglect that they have difficulty functioning in society. Enrolling in the main program at OMID becomes overwhelming for such fragile young women. Parvaneha provides a gentle transition from their horrific pasts to their future at and beyond OMID. The name, meaning butterflies, was chosen by the young women to reflect their symbolic change from a small, vulnerable caterpillar to a beautiful powerful butterfly. 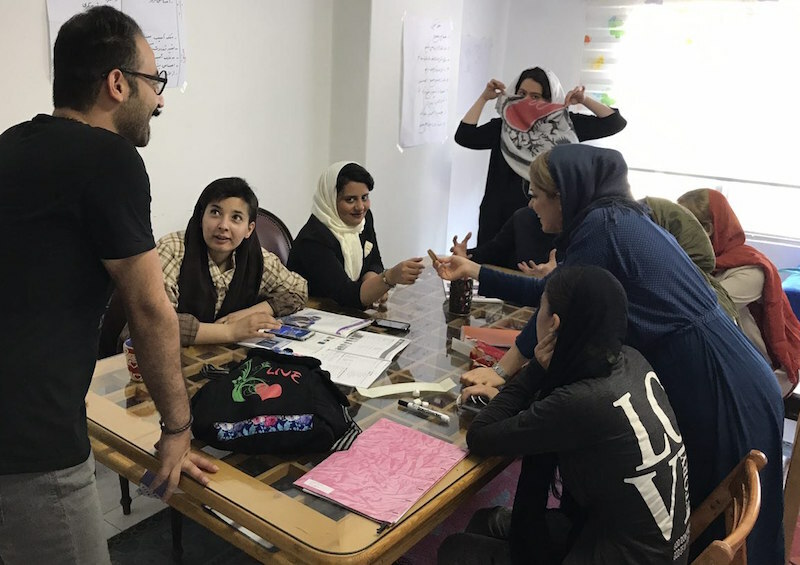 The young women enrolled in Parvaneha, who are usually between 17-21 years old, live and work in a safe and relaxing place with one room for classes and another room serving as a main communal living room. Here even basic life skills are combined with cooperative skills, for example in Parvaneha the residents cook and serve food for each other. They are nurtured to learn empathy, collaboration and team work. Two specialist employees work with them on computer and art classes. Again, to protect these fragile lives, Parvaneh classes are run separately from the main program at OMID, the main purpose being to support these girls to gradually rejoin the main educational program at OMID and complete the educational package in order to graduate. Before we had started the Parvaneha program, some young women had struggled and were hardly present in their classes, resulting in their missing out on on-going communications and vital support. Among this first group, one of the young women is now an assistant in dance classes, helping out our dance teacher in instructing the new group that joined OMID in April. Furthermore, two of the young women have registered their names for school and have started studying in order to get their high school diplomas. We are also proud to observe the impact of the safety we provided in one of the young women who started with us in a somewhat inhibited state, not being articulate and not making connections with others. After 9 months of being at Parvaneha she has started voicing her opinion, saying ‘No!’ when needed and initiating contact with others. Our Dialectical Behavior Therapy (DBT) approach, a method used for regulation of emotions, stabilizing and managing risky behavior, has played a major role in the success of this program. Based on our experiences with our first group in Parvaneha,we have made small but significant changes in a way that works more in line with the education department. Thus, the young women, complete their computer classes and workshops with the rest of the girls in our main program and so are not entirely separated from the other groups. Last but not least, we have also started a new group with some more delicate young women who have joined us recently.